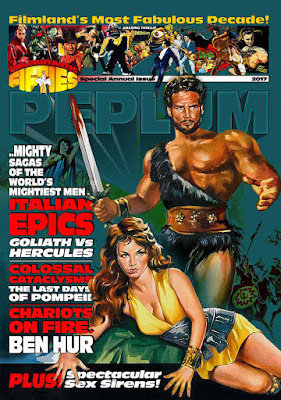 According to The Fantastic Fifties magazine, in an edition dedicated entirely to the PEPLUM genre, Steve Reeves was set to star in ONE MILLION YEARS B.C., along with Raquel Welch. According to this unearthed interview, Reeves was offered $50k to work on the caveman film. He refused the role since Italian producers payed him 5 times that amount. Now that would have been interesting. With that being said, John Richardson (below) did a great job in that role but even so, the pairing of Reeves and Welch was actually a fantasy pairing I wrote about years ago, and it almost came true. The Fantastic Fifties edition on the PEPLUM genre unearthed a forgotten Steve Reeves interview in which he said he was offered the male role in ONE MILLION YEARS B.C.. More on this magazine in a future post. In the mid-1960s just about every male college dorm room had a poster of Raquel Welch in her minimal fur bikini. Che Guevara was another very common poster subject. His poster was often hung beside the one of Raquel. I am old enough (72) to know, having been there at the time. 50 grand was a pretty dinky salary for a lead man in a Hollywood production, even way back then. No wonder Reeves turned them down if he could make five times that amount and live in Italy. Being both a fan of stop-motion, and an animator myself, it would've been very exciting indeed to see Reeves square off against Ray Harryhausen's monsters. Harryhausen had long-standing plans for adapting the Aeneid, complete with Scylla and Charybdis, the harpies, cyclops, and the journey to the underworld. Since Reeves actually played Aeneas, having him appear in Harryhausen's project would've been a perfect creative marriage, I think.